One of the judges commented that she should have paid more attention to the detail INSIDE the playhouse, as there wasn't much for the kids to play with. This, I have to say, I agree with. There wasn't much - not even flooring really. But, the outside was AMAZING, as you can see. Those flower boxes are decorated with pencils on the outside. The perfect house would have been this one, with the losing house's inside. In there, she had a corkboard painted red and shaped like an apple, a chalkboard wall for the kids to draw on, and a whole wall wallpapered with sheets of notebook paper. Her inside was better, but this one was over the top for outside construction. This is the lovely Crossover Lace Sweater from Juniper Moon Farms in Findley. It wouldn't be mine if it weren't Midnight, or black. Black goes with everything! :) I'm making the 43" size, and I think I need to up it to the 47.5" size. I could up it to the largest size (it only takes 2 skeins for the largest three sizes) but I'm back on my diet and exercise routine (although not so much on the exercise) so the weight should hopefully start dropping off again. 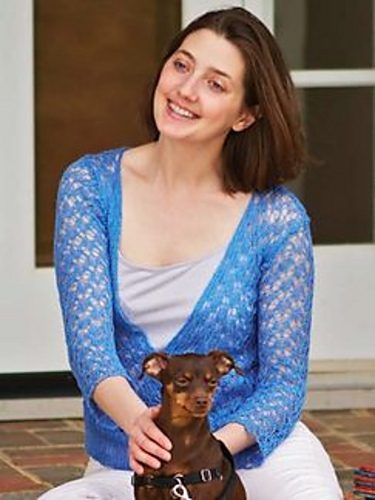 Those were the days - I didn't get much knitting done, but I sure did look good when I did it! :) I'll get there again. Now that school is over, I can focus more on me and the family, and the knitting. And crocheting. And did I mention the sewing? Yes, I've started sewing too. That's where the Sash with Beaded Fringe came from. I have LOTS of fabric for quilts. I say "lots" - probably not as much as some, but I do have enough for about 4 quilts currently. Granted, they are all small ones, but they're there. I hope to work with what I have for the rest of the year. Do you know about Christmas in July yet? NO? Well, let me inform you then. Christmas in July is at The Whole Nine Yarns in downtown Woodstock on July 22nd. There will be LOTS of free patterns, and some for sale as well. You pay $5 at the door (or at least we have in the past) and you get a folder. In this folder you collect the free patterns (please, don't take the for sale ones, it cause all kinds of heartache and indigestion when things get taken) and they are all fabulous fast gift ideas. I've had a couple there, and I plan on having at least 2 this year. I've already completed one, and the second one will be coming soon as well. Once I have them done, after Christmas in July, I may just post them here. Wouldn't that be fun? I've been having a huge brainstorm of ideas recently, so I've been taking diligent notes so that in the coming months I can create them and let you all see what's floating around in my head. Okay, maybe not so much...but at least let you see the PATTERNS floating in my head. Sound like a plan? Okay. 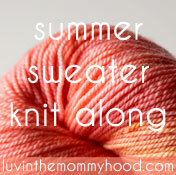 So, go forth my lovelies, and sign up for the Summer Sweater Knitalong on luvinthemommyhood site, and then tell me you're joining me! Oh, and PLEASE don't worry about time - you have until September 30th to finish your sweater! I'm super ambitious and want to finish 3: one for me, one for Little Man and one for Princess. Hubby doesn't wear sweaters often, so unless it's really lightweight, he's not in the market.